Indiana Raptor Center is a 501(c)(3) non-profit organization dedicated to the rescue of injured or orphaned wild birds, their rehabilitation and their return to the wild. Our officers, board, and volunteers are a community of human supporters who actively promote education of the public on the importance of habitat preservation and the appropriate care of injured birds. Our mission is comprised of a triad of objectives, none of which may be effectively achieved without the others: Rehabilitation, Education, and Conservation. Rehabilitation is the visible act of kindness that begins when an injured or orphaned wild bird is found and ends when the bird is returned to the wild. For the safety of the general public and the well being of wild birds, individuals are discouraged from attempting medical care of wild birds. To enforce this, most wild birds are protected by state and federal laws. The emphasis is not only giving quality care, but giving that care in a low stress environment! What we do does have consequences and a goal of InRC is to reach as many people as possible with that message. For example, you might think that throwing an apple core out of the car window is ecologically sound: before it biodegrades, it will feed a family of mice. While there is some truth to that, mice attracted to the edible litter at roadside become a deadly temptation to the birds of prey who work daily to control the world’s rodent population. InRC provides education to the community through a traveling, multi-media program designed by professionals to maximize the live bird experience. To rehabilitate without educating is a waste of opportunity. Raptors serve us in many ways, but perhaps the most important is their ability to create an emotional bond with nature. One stolen eye-to-eye encounter with a red-tailed hawk or a great horned owl is enough to instill in children a life long respect for the natural world and will someday translate into action in their own lives! Indiana Raptor Center has presented to all kinds of gatherings and organizations, including public and private K-12 schools, scouting groups, civic organizations, church groups, parks and recreation sites, special needs groups, and pre-service teachers and biologists.If you have a group who you would like InRC to present to, please get in touch! Rehabilitated Barred Owls in their enclosure, shortly before release. There are three key factors that determine the success or failure of wildlife: habitat, habitat, and habitat. Unfortunately, this mantra has become an old saw that rings out of range to ears deadened by the constant strum of social and environmental lament. It is, none the less, the truest of environmental statements. The solution is to take action. The conservation portion of our education program is designed after methods proven by Wisconsin educators that stress leaving a place for wildlife. But why? 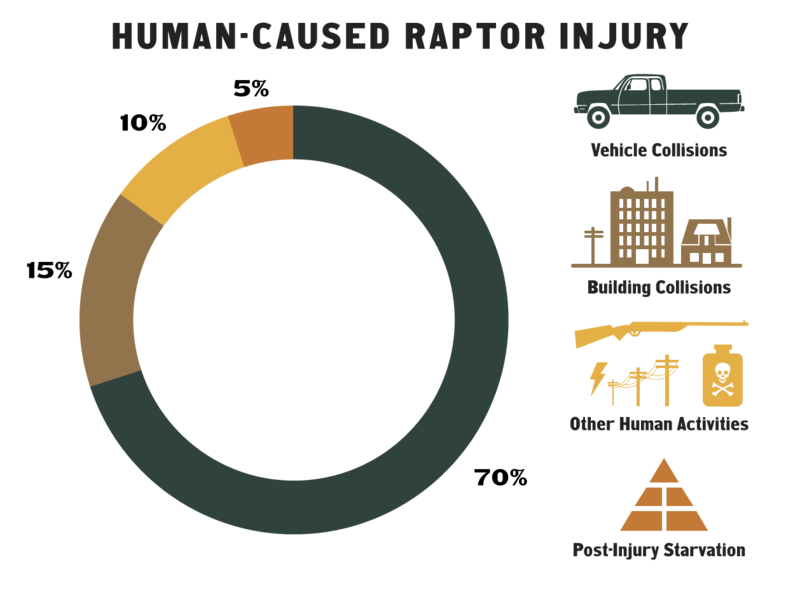 What do raptors do for us? They work for us every day, combating the spread of disease and curbing rodent damage to property and crops. Think of this: one rat can cause $14 of damage to a crop in a year. However, one pair of red-tailed hawks can catch and dispatch 400 rats during a season of raising their young. By preserving a few large trees, a farmer can encourage hawks to nest on his property, potentially preventing $5,600 in damage. The American kestrel and the eastern screech owl are secondary cavity nesters. This means that they raise their young in natural hollows or tree holes that have been abandoned by large woodpeckers. With swift suburban accretion, natural nest sites are being reduced at an alarming rate. Oberon, a Barn Owl and one of our raptor ambassadors. Indiana Raptor Center has been working with local scout groups to build and mount nest boxes. The goal is to establish a reliable trail of occupied boxes. This promotes an increased population and supplies conspecific foster parents and like-aged siblings for the true orphans of spring (fortunately, raptors do not count and so take in stride the sudden appearance of a new face in the brood!). Barn owls, an endangered species, have are also an important part of rodent control. It has recently been discovered that the heat of just one live cow and the hay mow to support that cow is just enough to make Indiana barns hospitable in winter and if the digs are good in winter, the owls stay for summer and mate. The upshot is the disposal of roughly 600 mice (each causing $25 worth of crop damage in a year) at a potential savings of $15,000 on a large farm, without having to put out poison!